Dois outdoors com convite a uma visita à quinta e uma oportunidade de aquisição de vinhos e produtos regionais impeliram-nos a entrar. Foi nas férias de Verão de 2001. Uma senhora jovem recebeu-nos com uma cortesia excepcional. Os meus filhos, então com 16, 12 e 8 anos, ficaram encantados com a experiência. Puderam brincar descontraidamente no largo, frente à casa e à capela, ver as vinhas e apanhar peras que então se apresentavam deliciosas, tendo a anfitriã feito questão de as oferecer. Como estávamos em fim de férias, trouxemos uma cesta cheia para Coimbra. Passámos pela loja de produtos regionais, onde adquirimos algumas garrafas de vinho da quinta, embalagens de compotas e de cereja em calda. Pudemos apreciar a grande variedade de artigos de artesanato expostos, entre os quais, panelas de barro preto, feitas em Fazamões, rendas e bordados, cestas de vime, chapéus de palha, compotas e Vinho do Porto. Pudemos visitar ainda o lagar tradicional e a adega, tendo sido dada uma breve explicação sobre o modo como se processa a vindima na quinta, a produção e o estágio do vinho. Com o portão geralmente aberto, num renovado convite a uma visita, essa tarde ficou como exemplo de bem receber, que não pode deixar de ser recordada sempre que os olhares se cruzam com a Quinta da Massôrra. Welcome to Quinta da Massôrra. This family property is located in the Douro Valley, close to a village called Resende, not far from Peso da Régua, Lamego, Cinfães, Baião and Aregos, in the North of Portugal. We dedicate ourselves to wine and fruit production: cherries, plums and chestnuts. Explore our website to get to know our family, our property, our wine brands, the fruit we grow, as well as the tours and wine tastings we have prepared for you. Browse our website to get to know us better! We look forward to welcoming you at Quinta da Massôrra. Once you have a chance to visit us, either for holidays, for a weekend or just a quick visit, do not think twice. You will not regret it! a GOLD MEDAL. Awesome !!!! But amazing is the wine!. Quinta da Massorra Arinto 2016 was considered by the wine magazine Revista de Vinho - Grandes Escolhas, as one of the Best Portuguese wines of 2017.
the 2017 that it is even most aromatic and fresh!. Unforgatable!. are also available at the Hotel's shop or on Yeatman's online shop. 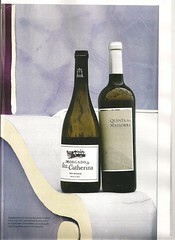 the 3 wines available at the YEATMAN!. 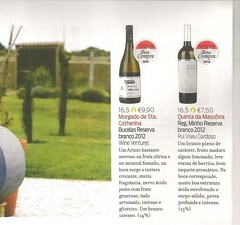 The Director of the main portuguese wine magazine, Revista de Vinhos, selected our red wine Encostas de S. João 2013 as its choice for the June's edition of the magazine. He finishes is description of the wine with the words "absolutely delicious". That's Fantastic but it was not a surprise for us because it's the true. 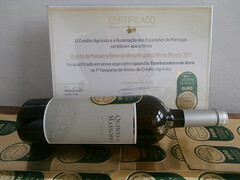 The wine was also awarded the prize "Good choice", for its excelent relation price - quality. 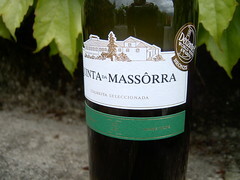 QUINTA DA MASSORRA RESERVA BRANCO 2012 was awarded a gold medal at the Lisbon national wine contest 1º Concurso de Vinhos da Caixa de Crédito Agrícola - Portugal Agro. Wines from the main portuguese wine regions were subbmited to that wine competition, and blind tasted by a pannel of winemakers, sommeliers, jornalists and wine bloggers. 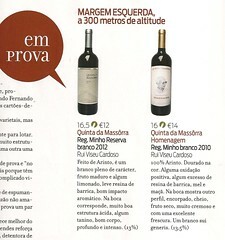 Once again, our wines produced at the Douro Region, in Resende, proved to be consistent and to have very good quality. 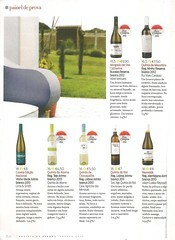 Surprisingly or may be not, our QUINTA DA MASSORRA RESERVA BRANCO 2012, was distinguished at a blind tasting organized by the portuguese wine magazine Revista de Vinhos, 2014 august edition as the best wine of the pannel. As a matter of fact, our white wine has been frequent and consistently awarded and highly recommended by professionals and wine critics. 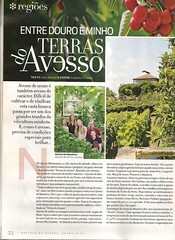 Quinta da Massorra in the July edition of Revista de Vinhos. 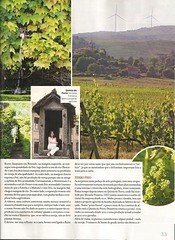 Article by wine expert João Afonso, following his incursion in the land of Arinto and Avesso grape varieties. Quinta da Massorra will participate in the most important wine event held on in Portugal: Essência do Vinho - Porto. More than 20.000 visitors are expected!. They will have the chance to taste more than 3.000 wines from the 350 protuguese producers that will be in the event. We will present our full range of wines: Quinta da Massorra Reserva red 2010, Quinta da Massorra Reserva white 2011, and Encostas de S. João white and red 2011. White wine, dense and aromatic: Arinto, just good grapes; 10 months into french oak barrels; weekly battonnage; lightly filtration, and ...., bottling. That's all. That was the recipe for the attribution of a bronze medal to our white wine, Quinta da Massorra - Colheita Selecionada 2010, in the Decanter World Wine Awards, one of the most important wine competitions. And of course, a lot of passion and dedication. We share our happiness with family, friends and clients. Please come and visit us and taste our award-winning wine.